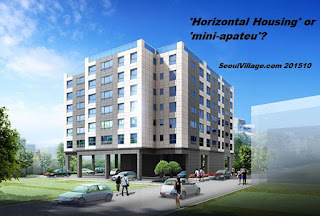 Nothing disruptive: for years, small developers have been building this kind of things by the dozens in clogged 'villa' areas like Gangseo-gu. If this fits the Hausmman-friendly 6-7 levels limit, it still looks like a 'mini-apateu'... and certainly doesn't deserve being heralded as an 'alternative to the New Town model' and an example of 'urban regeneration. This is precisely the kind of architecture that's destroying Seoul streets: a lifeless ground floor where cars matter more than humans. Call it a 'low-rise block' if you want, but if you intend to deliver serious urban regeneration, please go back to the drawing board.